*This post may contain affiliate links. Thank you for supporting our blog! and scientists continue to study the reasons why. your family may experience some sickness from time to time. take to help best support your children (and yourself!) nutritionally. 1) Cut out or lessen sugar consumption. I believe that sugar is one of the worst 'foods' of the Western diet. lends itself to all sorts of health problems. "Sugar can suppress the immune system and contribute to obesity." "Sugar (processed) contains no nutrients, protein, healthy fats or enzymes." "It's loaded into your soft drinks, fruit juices, sport drinks, and hidden in MOST processed foods." Some valuable reasons to consider lessening your family's sugar consumption! 2) Supplement with Vitamin D.
Where I live, in Canada, we are known for being at risk for lower levels of this vital vitamin. available in the house for our entire family. Especially since I breast feed my little ones. probiotic (helps support good bacteria in the gut). 3) Eat foods that contain living enzymes. Which foods contain living enzymes you may ask? Basically, ALL foods that are "alive" have living enzymes. So that would include plant foods! In all their colourful array. a) Stock up on a variety of fresh produce every time you shop. b) Include a salad "station" in as many meals as possible. c) Include the all fav smoothie as a breakfast option. 4) Keep nourishing bone broth in stock. I've heard it called Jewish Penicillin. The nourishing properties of this "wonder" food can't be overly emphasized. an addition your home can't afford to be without. AND affordable. The local butcher should have some on hand. Not only are minerals abounding, but it is chock full of easily absorbed nutrients. My Fav Nourishing Soup Recipe Is Found HERE. 5) As much as possible, make your food from scratch. Food that is highly processed is pretty much devoid of nutrients. By cooking from scratch, YOU are now in control of the content. are used to help keep food shelf stable. & other "undesirables" found in processed food. Of course, I realize that that it may not be possible to do this all the time. you are helping to GREATLY improve what your family will be eating. b) Getting into the habit of always cooking two+ meals at once. I.e. cook two chickens & save one for lunches the next two days. c) Become a good friend with your slow cooker. 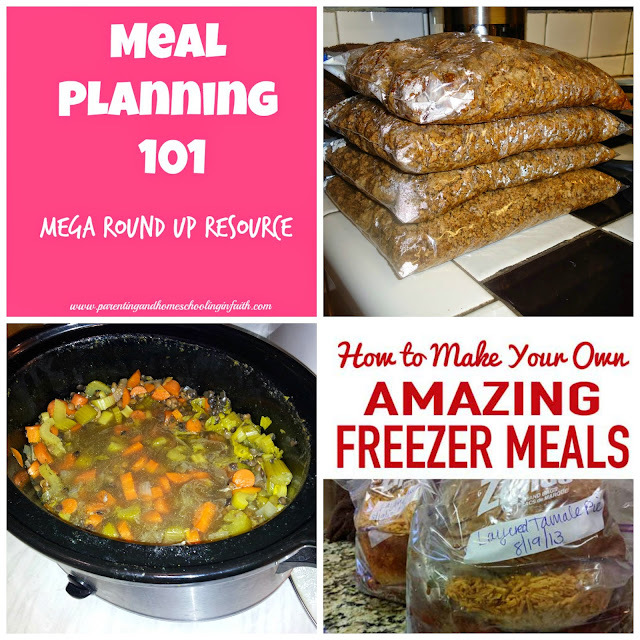 Less fuss & creates meals with less work! So there you have. 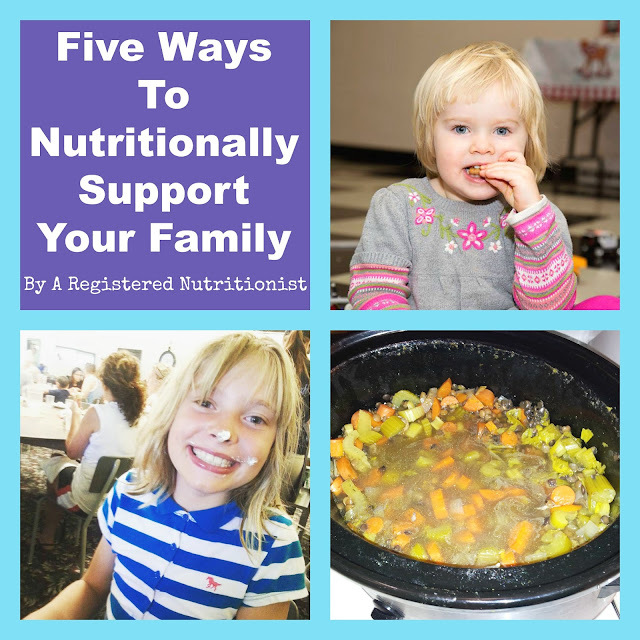 Five practical tips to help nutritionally support your family. Which one are you already going? Which one do you hope to newly implement this year? ***Note: this article is not intended to diagnose, cure, treat or prevent any disease. This is so helpful and informative Rachael. Cutting down on sugar consumption has a HUGE impact on health. I also like your point of making things from scratch. We're hearing more and more how processed food is harming our health! Cutting down on sugar probably makes the most significant improvements, but it's the hardest one to do, isn't it?? ;) At least I've sometimes experienced that myself. I need to get back on track with having us all take vitamin D again as it was something that slipped off the radar with everything else going on. Most people I talk to are so unaware that it helps to boost your immune system, but I have sure found it works. And this was a bad year for flus/colds where we are so we sure could have used it. Time to get this back into our routine so we can all stay healthy! One of my favorite uses for my slow cooker is to cook a whole chicken, as it makes it so easy to use that meat for sandwiches during the week rather than processed meats or to easily add into a casserole for a quick dinner! Yes, cutting sugar is a real challenge! Something that I need to restart-not easy in a family which loves cake. I love to bake, so learning newer, healthier ways to indulge my hobby was a challenge. 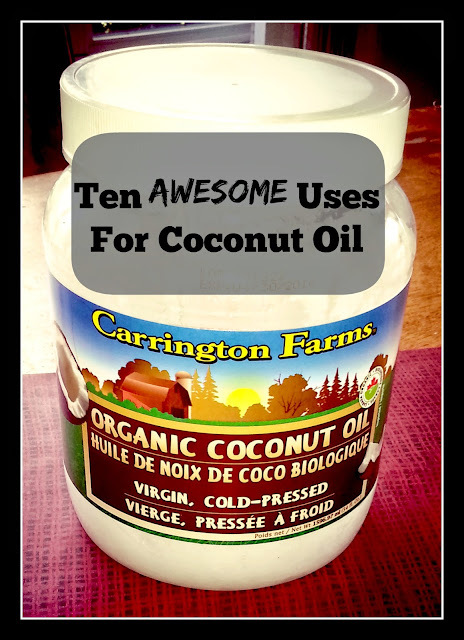 Substitutions, and experimenting with healthier ingredients, made a huge difference for me! What great tips Rachael! I am with you on cutting out sugar. I admit that I enjoy it way too much but there are so many great substitutes and I know that it really should be removed from our diet. I cook from scratch for the most part in our home so I feel any of the bad things are balanced out by the nutritious food I cook;) But I am always looking for ways to feed my family the best food possible. Thanks so much for this!! Great tips! Cooking from scratch is key I think. You can take out a lot of "stuff" by cooking with the basics. Thanks for linking up to the Country Fair Blog Party! 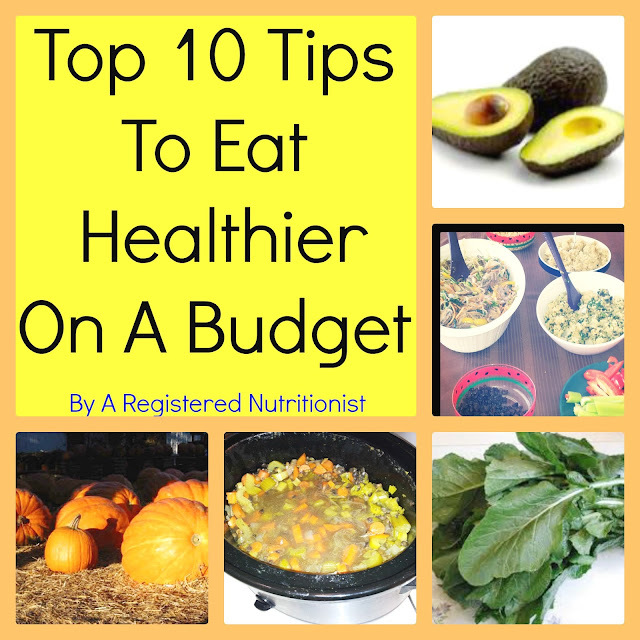 Top Ten Tips: Eating Healthy On A Budget!